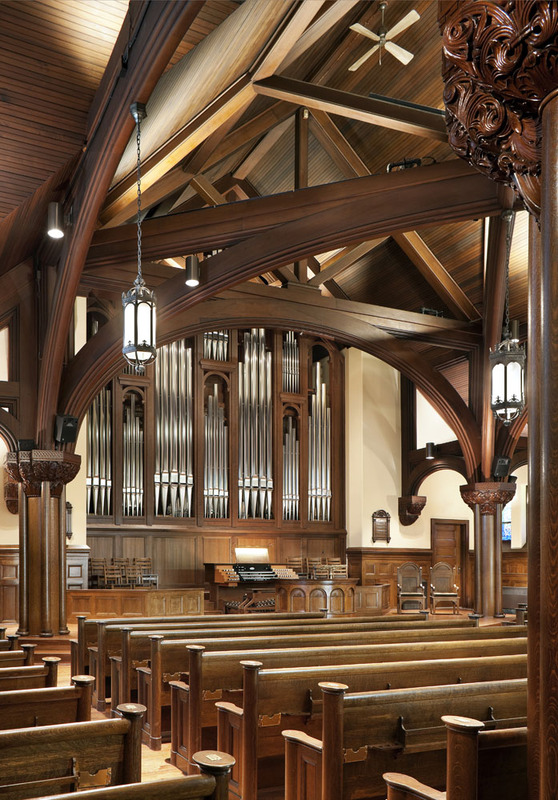 This project involved fairly significant renovations to an historic church. The original structure, completed in 1892, was designed by J. Cleaveland Cady in the Richardsonian Romanesque style. Cady is best known for his design of the south entrance range of the American Museum of Natural History on the Upper West Side of Manhattan. Our goal was to achieve the necessary changes in such a way that we paid proper respect to the original design without allowing it to constrict the creative process. 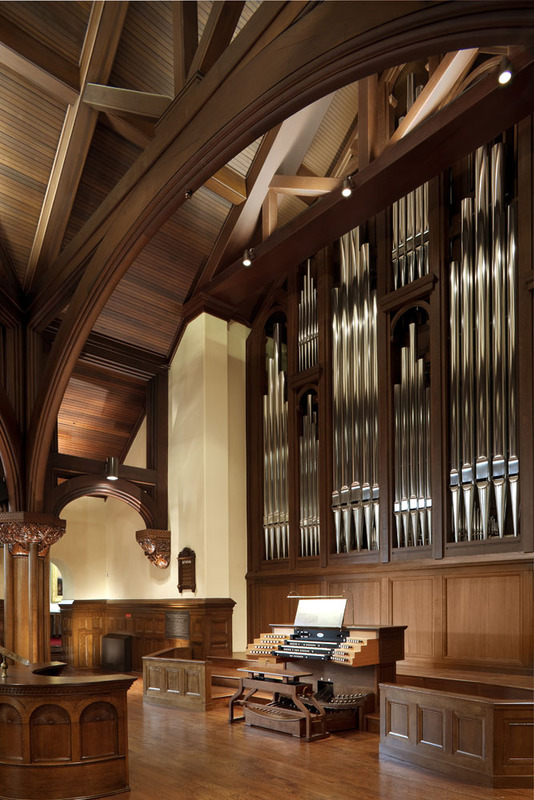 The major focus of the design involved the reconfiguration of the chancel and nave spaces to allow for the installation of a new tracker-type pipe organ, designed and built by Orgelbau Klais of Bonn, Germany. The new instrument was placed in the area formerly occupied by the pulpit, the choir and an old electronic instrument. As a result, the pulpit and choir were pushed forward into the nave space. Our mandate was to accomplish this while removing as few pews as possible. The design concept incorporates a gently curved dais for the pulpit, the choir and the new organ console. This platform was designed to be used primarily for weekly worship services, but to allow for enough flexibility that it could be easily transformed into a stage for community events such as concerts, plays and lectures. To achieve this, it was necessary to remove an existing proscenium arch, which presented major acoustical and visual impediments for the new instrument. In addition, our plan called for the removal, restoration and relocation of a grouping of stained glass windows designed by Louis Comfort Tiffany, which otherwise would have remained hidden within the confines of the pipe chamber. The project was accomplished in three phases. 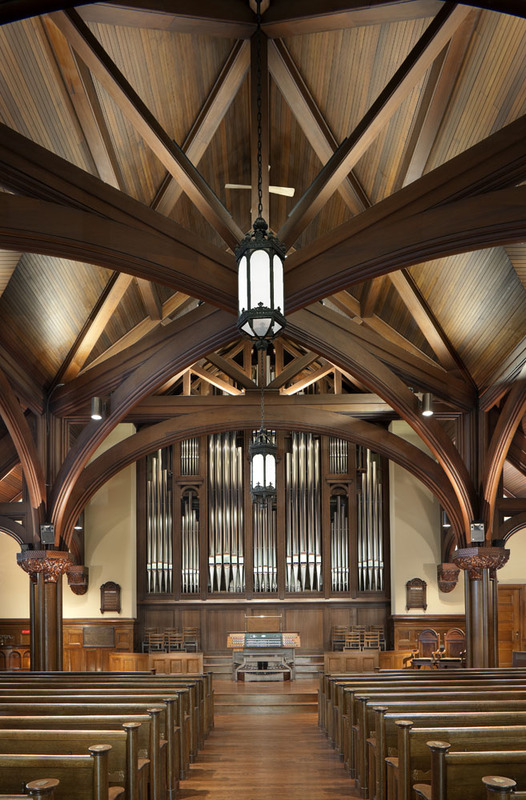 The first phase, completed in the summer of 2009, involved reconfiguring and renovating the sanctuary space. The second phase, completed the following summer, involved the installation of the instrument. The final phase, completed in the summer of 2014, involved installation of the restored Tiffany windows at the rear of the nave space.